Experienced American Dior Lowhorn (201-F-87) had a great game in the last round for league's leader Satria Muda and that's him to receive a Interperformances Player of the Week award for round 24. The 30-year old forward had the game-high 45 points adding seven rebounds and five assists for Satria Muda in his team's victory, helping them to outclass Bima Perkasa (#4, 6-11) with 28-point margin 107-79. It allowed Satria Muda to consolidate first place in the Indonesian IBL. Satria Muda have a solid 15-2 record. In the team's last game Lowhorn had a remarkable 66.7% from 2-point range. He turned to be Satria Muda's top player in his first season with the team. University of San Francisco graduate has very impressive stats this year. Lowhorn is in league's top in rebounds (7th best: 10.0rpg) and averages solid 66.7% FGP and 71.4% from behind 3-point line. 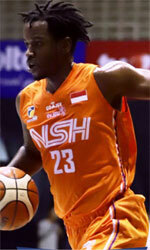 The second most remarkable performance in last round's games was another Satria Muda's star - 29-year old American forward Jamarr Johnson (193-F-88). Johnson impressed basketball fans with a triple-double of 28 points, 10 rebounds and 10 assists. Of course together with Lowhorn he helped Satria Muda with another comfortable win outscoring the lower-ranked Bima Perkasa (#4, 6-11) 107-79. It was definitely game of the week between two contenders to the top position in Red Group. Satria Muda consolidated its place in the very top position of the standings. His team lost just two games this season, while they won 15 matches. Johnson is one of the most experienced players at Satria Muda and similarly like Dior Lowhorn has a reputation of one of team's most reliable players. The third best performed player last round was American David Seagers (188-G-88) of Pacific Caesar (#3). Seagers got into 30-points club by scoring 31 points in the last round. He went also for ten rebounds and nine assists. 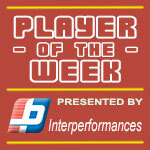 He was a key player of Pacific Caesar, leading his team to a 86-81 win against slightly lower-ranked NSH (#5, 3-14). Pacific Caesar needs these victories very badly if they think about getting closer to top teams in White Group. Their record at this point is 10 victories and 6 lost games. Seagers has a great season in Indonesia. After only 3 games, he made it on the list of the league's leaders in points with 32.3ppg (9th best) and assists with 8.3apg (best passer).